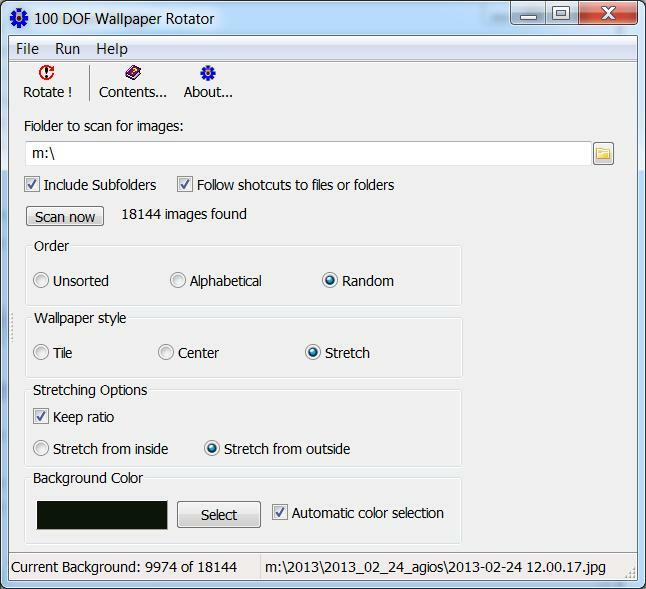 100dof Wallpaper Rotator is a simple program that can be used to rotate Windows Desktop Wallpapers from a user defined folder and/or sub-folders. Wallpaper Rotator is ideal to be run on system startup. It consumes no memory or other system resources since it does not stay resident (just changes the wallpaper and then exits). A handy feature of 100dof wallpaper rotator is that it can also follow windows shortcuts to directories and image files. That is, you can create a folder that contains shortcuts to your favorite images or shortcuts to entire folders with images and setup 100dof wallpaper rotator read images from this folder. Minor interface enhancements. Changed registry path for saved options. Added option to follow shortcuts.